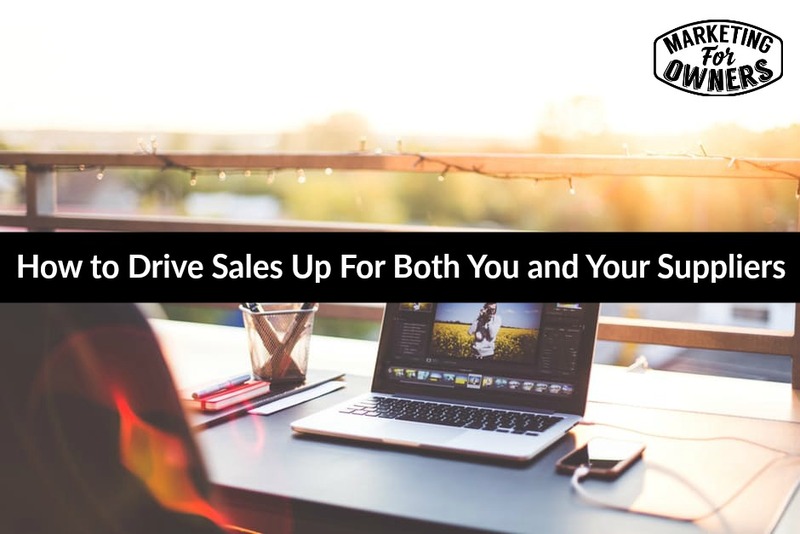 How do I get you to drive sales up? Now I am going to use an example of a photographer. A wedding photographer. And this can be simple. I’ll show you in a minute how you can apply it to others. So at a wedding, you have a wedding photographer, you’ve quite often got the venue, the church, the minister, you’ve got flowers, and you’ve got food. You’ve got a catering supplier, you’ve got a bar, you’ve got a disco or a band. All these people. And maybe even a videographer. So as the wedding photographer, when you are taking photos of all of the bride and groom and the lovely family and the day, why don’t you, as the photographer capture some beautiful photos of the other suppliers? Because you’re all in this together. And you’re quite often going to be in the same places. Now the cake decorator, she has a shop or whatever. She has clients, she wants more clients. You create, blow up that photo, print it out, frame it, putting your, putting her information on it and putting your information at the bottom. And then you go into her shop and you present it to her. And you do the same to the venue and you do the same to the others. Now is that going to cost you a thing? Does marketing cost money? Yes. Marketing costs money. Don’t give me the, oh hang on how much does that cost? You are getting it at discount. Because it’s what you do. But marketing costs money, your time, anything. Isn’t this great? In a person who makes wedding cakes, once you do something like this, she will be saying what a wonderful photographer you are. It’s going to be displayed with a band that does weddings. It’s going to be displayed at a caterers, who caters for weddings. Do you get this? Yeah. So you are going to help make them look good and the win win is yeah. They are going to be chuffed to bits. As we say. Happy for you overseas people. It does work. Now just think how this can apply to you. Instead of giving, ‘Oh we don’t do anything like that.’ Just think. So for instance, if are you a landscape gardener, you must buy your stuff from suppliers somewhere. Bushes, trees, grass. Why not say it’s a garden center or trade supplier or something. Why not offer to do their landscaping for them or to do a patch. Find an area there, and say we’ll do that, we’ll maintain it. Can we put, can we do it for free, and put a little sign up there that says maintained by _____. ou’re going to do it for them and you get an advert in a garden center for all these people who say WOW. This is how it can look, look who does it? You’re thinking, wouldn’t they do it themselves? They’re a garden center not landscapers. See. Maybe you are an accountant and you work well with solicitors, lawyers. Why not go and do one of your accounting services for the solicitor and for another one. You don’t have to do all their accounts. But you can do something. You probably have some kind of package like some form of audit. And then, yeah. Just think. How you can use all this. There are ways my friend. Honestly there are ways you can do it. If you get your products in front of, in a 3rd party situation in front of their clients who would be your clients and you’re helping each other backwards and forwards. They may do something for you. Anyway that’s how you drive up your sales and theirs at the same time. A classic win win and we like those. It is a Monday. It is time for The Book For The Week. 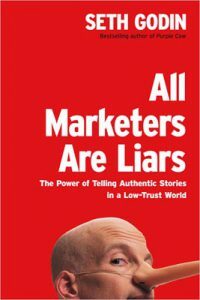 Now you will notice that I’ve recommend many Seth Godin books. And this one I love. It’s got an irresistible title, “All Marketers are Liars”. Now that may be true, it probably is. But it is a darn good book and it explains why. All Seth books are a quick read. They are great. What a great writer. It’s all I can say. I will be back tomorrow with another great tip.